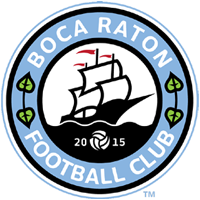 HIALEAH, FL – Boca Raton FC records their first draw of the season and a huge away point as the game against Miami United ends 1-1. The Boys in Blue produced a much better performance than in the early season 4-0 loss to Miami United. Boca Raton played well on both sides of the ball, with both possession being even throughout the first half. Both teams created quality scoring opportunities in the first half, with Miami’s being slightly more dangerous. A handful of great saves by Michael Stone, Boca Raton goalkeeper, prevented the hosts from opening the scoring in the early stages of the game. Carlos Palacios received a yellow card in the 32nd minute, forcing the Boca Raton midfielder to remain composed for the final hour of a physical game that was rife with fouls. Just before the half, both sides came close to scoring the opening goal, but staunch defending at both ends of the pitch nullified the attacks. The teams went into the break level at 0-0. After the half, both teams continued applying pressure. In the 48th minute, Michael Stone made a fantastic save to keep the score even. Roughly 10 minutes into the second half, the intensity of the game began to rise. Charles Smith received Boca Raton’s second yellow card in the 56th minute. Into the 70th minute, Miami United’s Nicolas Micoli received a yellow card for a challenge on Boca Raton’s Carlos Palacios. Just five minutes later, Miami was shown a second yellow this time to Juan Fuenmayor. It seemed as if Boca Raton found the breakthrough in the 77th minute, but Colby Burdette’s headed goal was ruled offside by the assistant referee. Miami United played the ensuing free kick very quickly, making their way into Boca Raton’s penalty area in seconds. Miami United were awarded a penalty as the referee whistled on account of a handball. The hosts took the lead as Miami United midfielder Tomas Granitto produced a cool finish from the spot. After the goal, Boca Raton FC began to push forward in numbers, recording multiple shots on goal. In the 80th minute, Miami were shown their third yellow card of the game, with Maximiliano Shenfield being the recipient. In the 83rd minute, coach Jim Rooney brought in Noah Graziano to replace Eusebio. With Miami leading the match, Boca Raton ferociously fought for a goal, combining well in the final third. Their efforts paid off as the Boys in Blue found an equalizer in the final moments of the game! In the 90th minute, Carlos Palacios finished a great run by finding Matheus Ayrolla, who turned and slotted the ball past the Miami United goalkeeper. Tensions rose in the dying embers of the game, but the game ended at 1-1 as the referee blew the full time whistle. Next weekend, the Boys in Blue will travel to Jacksonville to take on the Armada. This will be the second meetup for these two teams this season.